A Tibetan blogger in Beijing will sue the Chinese government for its refusal to issue her a passport. The poet Woeser has long been a rarity — a Tibetan living in China who doesn't flinch from publicly criticizing the Chinese government. Now the activist is taking another unusual step. Their reticence speaks volumes about the harshness of Beijing's repression in their Himalayan homeland — which communist troops took control of in the 1950s — and its policies aimed at diluting Tibetans' culture and identity. Woeser, who like some Tibetans uses only one name, says China's clampdown in Tibet has worsened since violent protests against Chinese rule in March  that Beijing says killed 22 people, but foreign activists claim took many times that number. The 42-year-old woman who stands barely 5 feet tall has sought to be a channel for her people's voices. "She went into unknown territory. I think no Tibetan had ever spoken out so openly in print or in the media," said Robbie Barnett, an expert on modern Tibet at Columbia University. 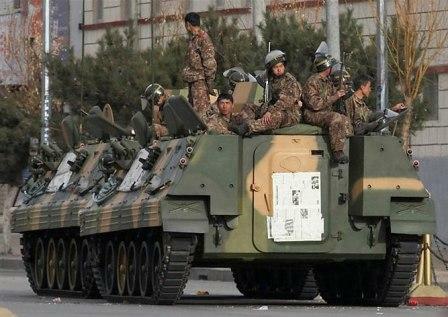 The fourth was one of the few sources of news coming out of the sealed-off region during the March crackdown. Then hackers posted threats against her on the blog and rendered it unusable. She has since started a fifth blog that is still running — for now. Born in 1966 — the start of Mao Zedong's radical and devastating Cultural Revolution — Woeser spent her childhood in Lhasa, the capital of Tibet. Earlier this year , Woeser was unable to accept a Freedom of Expression prize from the Norwegian Authors' Union in person because she does not have a passport. Her husband accepted the award in Oslo on her behalf.